Looks can be very deceiving in the muscle car world and this is no exception with this 1965 Impala field find. The owner dropped in an LS engine and then started to push the car faster and faster to the point of hitting 9.20s. What’s pushing this Impala to its limits? On top of the 6L LS it’s a 83mm Bullseye turbocharger with 30psi of boost, stock bottom end and Lil’ Johns stage two camshaft. All linked through a 4L80 transmission. 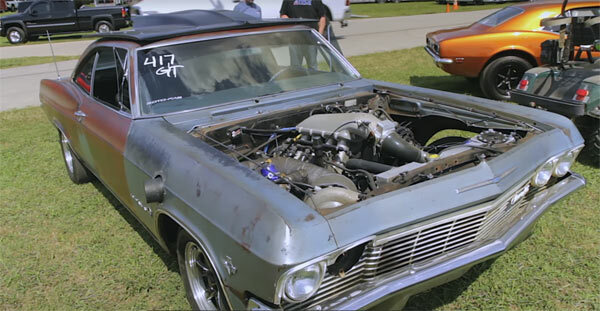 You can check out the rest in this video, shot at the LS Fest showing that with a bit of vision these old beauties can take on anything out there.